July and August, when daily temperature is above 40C, gardening is put on hold. The only "gardening" I do during this hot months is sprouting and micro greens. Luckily, a unique micro climate of the Ozark Mountains keeps somewhat reliable supply of cucumbers and tomatoes, and other vegetables at the local Farmer's Market. I bought some cucumbers to make a quick pickles, that Mr. I.V. has been asking for quite some time. I make it old fashioned way, using just water, salt and spices. Then I leave it to ferment for 3-4 days, and it's ready to eat. I remember when I lived with my parents, my mother would make a 3 liters (a little under a gallon) jar early in the morning, put it outside, and then she came back from work, pickles would be ready to eat. Mother calls it "young pickles" because they haven't developed enough sourness. 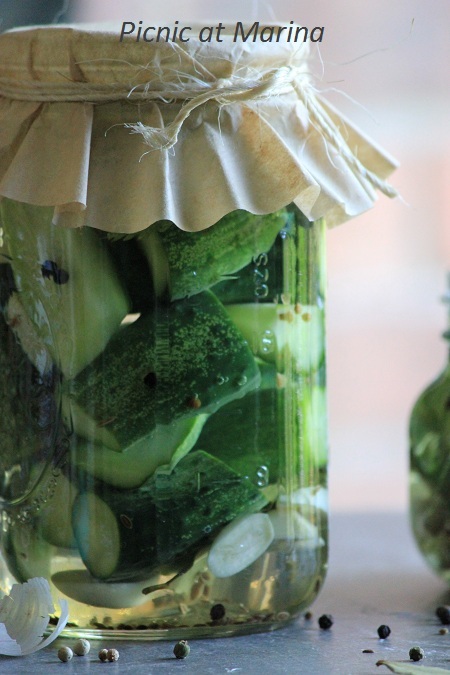 The longer you leave pickles to ferment in the brine, the more sour they become. For the brine I use my mother's recipe: 30 gram (2 tablespoons) of sea salt (or pickling salt) diluted in 1 liter of water. To keep pickles crunchy I wash them, then place in a container with icy cold water in refrigerator overnight. On the bottom of the jar place dill seeds, garlic cloves, bay leaf, coriander seeds, black pepper, and any other spices you like: experiment and improvise! Then add the cucumbers, and pour the brine over it to cover the cucumbers. Taste the cucumbers next day, then day after that, and then day after that again. Enjoy them as they ferment, then after a week move (if you have something left) the jar to refrigerator to slow down fermentation. Basil seems to like hot weather: this bouquet I cut today from my garden. 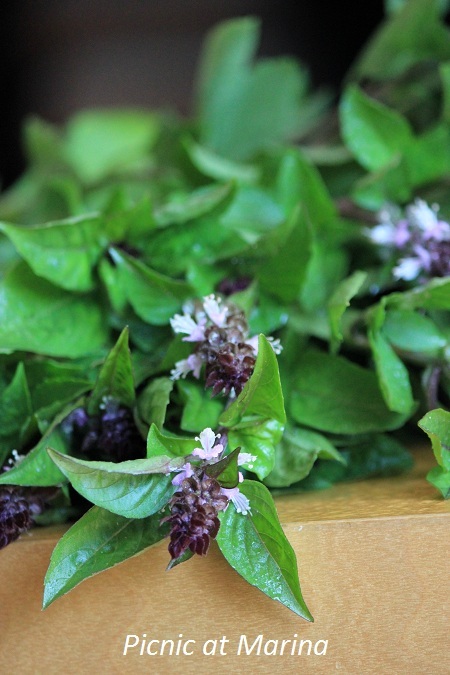 I let it dry, although I've never dried Thai basil before. Have you? Hello Marina, I am in love with your pictures! Thank you Sawsan! 1/4 cup of vinegar per liter? Interesting, I need to try it too. Does she leaves it to ferment at the room temperature? Yummy!!!! I love pickles and yours look so tempting!!! Your pickles do look crunchy and so delicious! Humm, no vinegar in the brine? What a unique idea, and they look delicious. I'll have to give them a try. This sounds like a wonderful and easy way to prepare pickles, Marina. I happen to love them but have found that when I preserve them, some of the "crunch" goes away. And I detest a crunchless pickle! So, it's refrigerator pickles for me and your recipe is one that I would enjoy, especially the part about letting them ferment until their taste suits me. Yum! Thanks, Marina. I've used an ice bath to restore limp lettuce but never cucumbers. I will now! Thank you so much for this! I can't wait to have excess cucumber to start pickling, bring on summer. These look fantastic - gorgeous colours... I can just imagine that kind of salty crunch they must have at the end. Absolutely adore pickles... we've been making some recently where you chop up veg in a bag, add some salt and spices and smush it around and then leave it for a few hours... makes a good snack. Need to get a hold of some of these small cucumbers, love them so much! I need to try that snack of yours, I would love that! I've never made pickles! How can I have lived so long without doing this? And your method is so easy - I'm going to have to give it a try. Our cukes are giving out (heat finally did them in) and our basil isn't doing at all well this year. Tomatoes are going crazy, though, so we're not starving. ;-) Nice post - thanks. I haven't made pickles for 20 years but these look fantastic! I've never dried herbs ever. shame on me. Oh I love your mother's name for 'young pickles', that's so sweet. 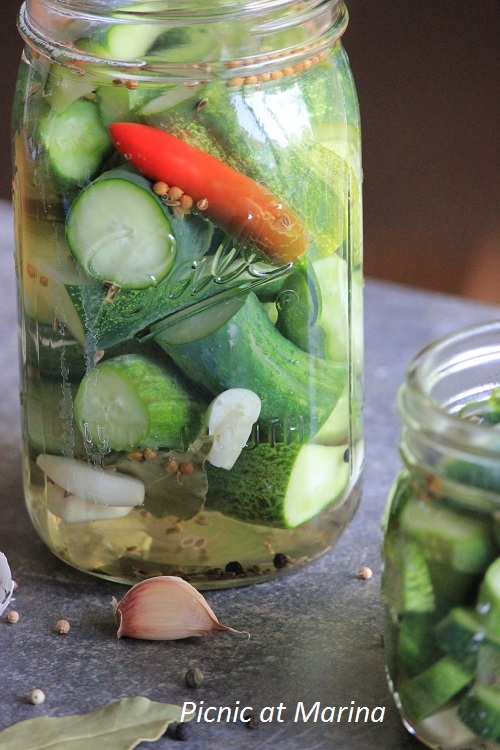 The pickling revival is only just taking off here in the UK (we're more into jams and chutneys) - my mum loves cucumbers so I might trying making a jar using this post as a gift to her. Thanks. Ohhh it'S been a while since I made pickles... Love it! Yours looks awesome! These pickles really look great! Love it! I cook everything with basil lately, very fresh taste! Your photos look amazing! 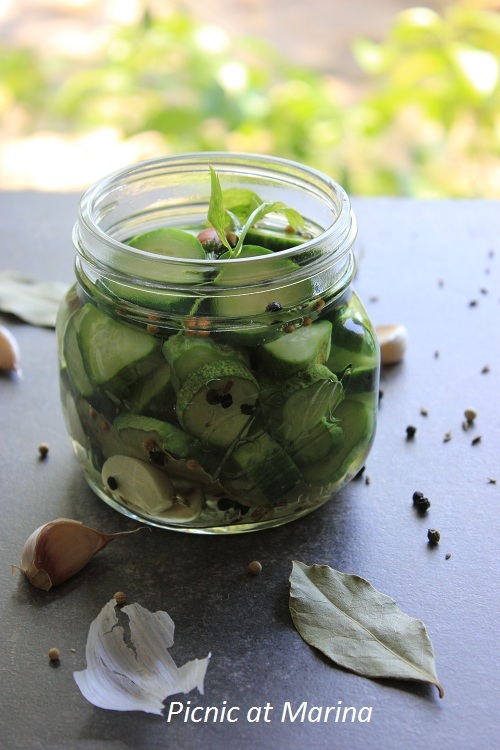 Lovely quick pickles makes ones tastebuds alive and active.